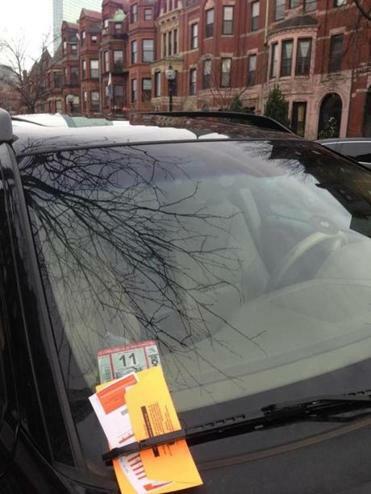 Boston parking tickets can now be paid with an app, TicketZen. Last Wednesday afternoon, I parked my car on Newbury Street, locked the doors, and deliberately strolled past the payment kiosk. Of course, in less than 20 minutes, a parking enforcement officer had slipped a $25 ticket underneath my wiper blade. I’ve been on a testing binge lately, checking out new products and services with local ties. Not only did I troll for tickets, but I tried on pants, sipped tea, and inserted my smartphone into a Nerf-like ball and tossed it around the room. All for you. Here’s my rundown. Handybook is a startup conceived by Harvard Business School students and incubated at the Cambridge venture capital firm Highland Capital Partners. (It’s now based in New York, with funding from Highland and another Cambridge firm, General Catalyst.) On the Handybook site, you can arrange to have a cleaner, handyman, plumber, or electrician come to your house on a specific day and time. I summoned a house cleaner last month to get my house ready for a holiday party — with less than 24 hours notice. A super-friendly woman named Jamila showed up exactly on time and spent two hours cleaning. I paid Handybook $66. I liked that I didn’t have to sort through pages of service providers; Handybook just pings its network and whoever wants the job responds to a company text message. The company does background checks and in-person interviews of everyone in its network. I’d definitely use the service again. The RoadWars app (iPhone only) tries to promote safe driving. You start the app when you get into your vehicle, and it turns your travels into a game. You “capture” roads that you use frequently, and other RoadWars players have to pay a virtual toll when they use them. You do the same when you drive on their roads. The app also alerts you if you’re speeding and chastises you if you pick up the phone while moving. When I was running the app, it definitely kept me more focused on driving well. But not enough people are playing the game yet to make it fun (it just launched in November). RoadWars was developed by Paul English of Arlington, a cofounder of the travel site Kayak. While I love the pants and was happy to pay $95, the e-mail correspondence involved in arranging everything was a bit excessive. At the time, I wished the company had a way to schedule showroom visits on its website, something that was added recently. You can’t yet buy CogniTea, but founder Alex Kravets sent me a few bags for sampling. The blend of herbal and caffeinated teas and an amino acid called L-Theanine is intended to “help promote Alpha brain waves.” The tea was light and minty, but I didn’t feel any Alpha brain waves emanating from my noggin. Maybe I’m too much of a coffee addict. The New Hampshire startup Physical Apps sent me a free TheO Smartball Jr., hoping for a review; the orange foam ball sells for $34.95. I downloaded several free games and then put my iPhone into a special holder that keeps it securely seated in the core of the ball. There’s an opening so you can see the screen. But the adrenaline rush of worrying that something bad will happen to your phone is more thrilling than the games available, like bowling and hot potato. And the sound effects are muffled. My kindergartner said his favorite games were “Birds” and “Instruments,” which invite you to shake the ball and then display different images of birds or musical instruments, along with the sounds they make. The games were more fun when I linked my phone to a wireless speaker. I’d gladly pay a buck or two for better software. Within an hour of getting my parking ticket last Wednesday, I downloaded the TicketZen app and scanned the barcode on my ticket. The app, created at Terrible Labs in Boston, said the ticket wasn’t yet in the system, but promised to notify me when it was. By the time I woke the next morning, an alert on my phone told me the ticket was ready to be paid. The app saved me a bit of pecking by using my phone’s camera to scan the numbers off my credit card; once I typed in my name and address, I was done. A confirmation e-mail appeared seconds later. One service I haven’t yet test-driven: Cubbyhole, an iPhone app that lets you store your stuff in a neighbor’s closet or basement, or “host” someone else’s stuff at your place. Renters pay about $65 to use a 5-foot-by-5-foot space for a week. Hosts get 80 percent of that money, with Cubbyhole pocketing the remaining 20 percent. Hosts can view a photo of items to be stored before consenting. I do have some spare basement space, so I’m tempted — but also a bit wary. I acknowledge that a stack of cardboard boxes would be much less demanding than, say, an Airbnb traveler from Manhattan staying in my guest room. But I also don’t enjoy late-night knocks on my door from cops holding search warrants . . .